It's been a big month for one-box music streamers, with the Sonos S5 reviewed on page 76, but Bose's SoundLink offering is content to keep things simple. Rather than connect to the internet, this wireless unit pairs with an included dongle/transmitter. That USB key then plugs into a separate PC or Apple Mac and syncs with iTunes in order to stream your entire music collection. It doesn't even need a home network to operate, so it is ideal for those who shudder at NAS boxes and the like. 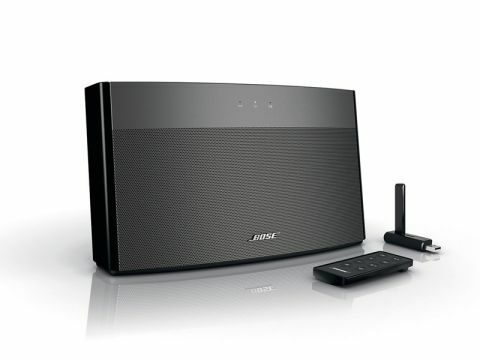 Boy, if you're a fan of bass, the SoundLink won't let you down. Its adoption of the company's proprietary Waveguide technology allows for very accurate low frequency response. The unit has a rechargeable battery, allowing you to carry it from room to room without having to plug it in each time. The wireless dongle and receiver in the SoundLink can still communicate up to 60 feet away from each other. They also use a Wi-Fi tech that doesn't conflict with a conventional internet protocol. A rear-mounted auxiliary input allows you to connect a separate audio source via a mini-jack. Works with some online music streaming services (such as Spotify) as long as you have them set-up on your laptop or desktop computer. However, its reliance on iTunes restricts the SoundLink's file type compatibility to an extent, and may put off Windows Media Player devotees. Also, neither the unit nor the supplied remote have a screen, so it is hard to choose what you want to play from a computer if you haven't already set up playlists.